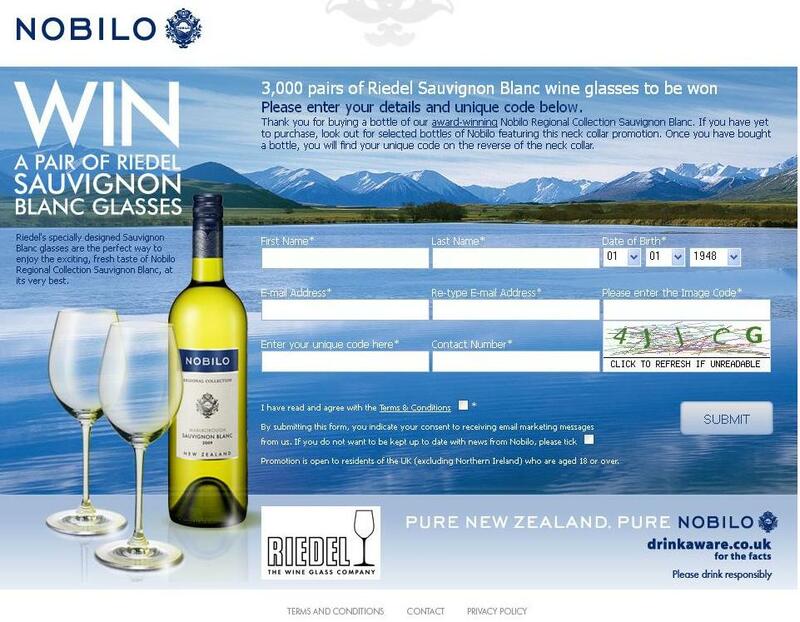 New Zealand wine label Nobilo is currently running the following promotion in the UK using online registration. Simply buy a bottle of it’s Sauvignon Blanc collection and enter your details to stand a chance to redeem a pair of wine glasses by glass maker Riedel. Specially designed for white wine, the custom shape of this glass allows for balanced stability and taste. This allows wine enthusiasts to fully appreciate Nobilo. With no branding on the glasses, this enhances simplicity and sophistication of the item, increasing perceived value and making it a great incentive product. The promotion mechanism used is a lucky draw campaign. Simply insert the unique code found on the reverse of the neck collar into their website to enter. With only up to 3000 pairs on offer, this creates exclusivity which encourages customers to participate. This exclusivity also helps communicate to customers that Nobilo is a premium wine label. Marketing wise, the campaign allows Nobilo to enhance its online marketing as customers who redeem the product would be notified of further events or offers through email. This opens the door to future promotional campaigns Nobilo may wish to conduct in future. For more wine themed blogs, check out the related blogs below. Corporate Gift Ideas: Wine Accessories.